You strike out from Oykel Bridge along an excellent 4x4 track that takes you all the way to Salachy. From here on, the path becomes boggier as it follows the River Oykel around to Loch Ailsh, but it's more pleasant on balance than hacking up hill from Salachy on a rough path through the woods to the (rather dull) 4x4 track, but that is another option and shaves off a little distance and time. Once you reach Loch Ailsh you'll join another 4x4 track that takes you up to the splendidly located Benmore House (please note this is a private establishment and does not offer accommodation). As you strike north from the house, you move onto the stunning aprons of Ben More, following the River Oykel to its source. In the season, salmon return here to spawn, leaping out of the river from time to time. As the track climbs towards Breabag Tarsainn, the ground becomes steadily rougher and the path harder to follow. In wild weather this is challenging country. After a steep traverse to the pass, a narrow v-shaped notch, the path onwards is steep and rocky and should be negotiated with care on the way down. The ground soon levels out and you head down over yet more rough, boggy trackless ground to a potentially difficult crossing of the river Traligill. After this, a clear path follows the north bank down Gleann Dubh to Inchnadamph. There is a hotel and a friendly hostel. At the time of writing the Postbus also calls here on its journey south to Lairg. 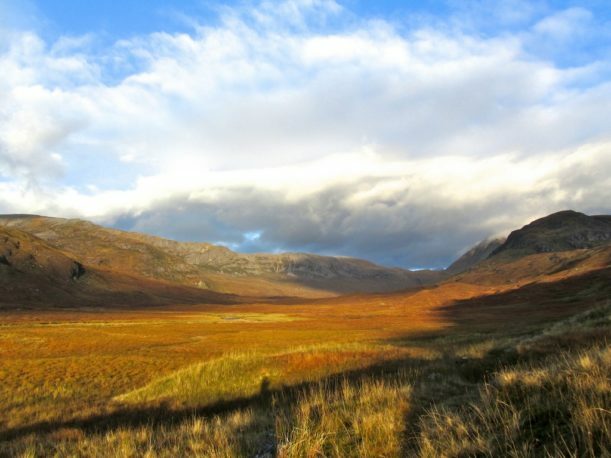 If you have no desire or need to head to civilisation at Inchnadamph, you have the option to continue north east past Loch Ailsh via Loch Carn nan conbhairean, contouring round Ben More Assynt to Gorm Loch Mor. From here a short up and over to Loch an Eircill brings you to a path that you can follow all the way to rejoin the main route at Glencoul. This is all rough, challenging mountain country and on balance a harder alternative to the main route.